British Columbia’s #1 Resource for Everything GIANT PUMPKIN!!! Award winning Giant Pumpkins grown by hobby farmer, Scott Carley. In 2013, Scott decided to get serious about growing Giant Pumpkins with a 853 pound pumpkin that placed (tied for) 2nd in BC’s Official Great Pumpkin Commonwealth (GPC) and Certified World Recognized Giant Pumpkin Weigh-Off Event! In 2014, Scott grew a few Giants over 1,000 pounds and it was the 1,177 pound pumpkin that placed 1st in BC!! In 2015, Scott’s giant pumpkin (1 of his 4 largest ones) weighed in at 1,427.5 pounds and placed 1st in BC!! And, Scott’s green monster squash weighed in at 725.5 pounds and set the new BC Squash Record!!! In 2016, Scott’s giant pumpkin weighed in at 1,172 pounds and placed 1st in BC (for the 3rd year in a row)!! It was smaller than last year’s 1,427.5 pound Giant and his goal to grow a 1,500 pound Giant, and this was due to cooler weather conditions this year. Click 2016 for more. Scott Carley now holds the distinction of having cultivated the HEAVIEST PUMPKIN in BC history!!! The previous provincial record, held by Jake Van Kooten of British Columbia, was also once the WORLD RECORD in 2008, with a pumpkin tipping the scales at 1,536 pounds! Fun fact, Mathias Willemijns of Belgium, presently holds the WORLD RECORD since 2016, with a massive pumpkin at 2,624.6 pounds!!! Click 2017 for more. Photo of Scott Carley with his 1st place award winning pumpkin on Oct 7, 2017. Click 2017 for more media. Click 2017, 2016, 2015 and 2014 and 2013 to follow BC’s Annual Giant Pumpkin Weigh-Off story and view MEDIA (TV interviews, news articles and photos) from past events. On Oct 10, 2015, Scott Carley’s giant pumpkin (1 of his 4 largest ones) weighed in at 1,305.5 pounds (lighter than the estimated weight of up to 1,600 pounds) and placed 4th (out of 25+ entries) at Central Market in Shoreline, Washington, USA!!! It qualified Scott for the 4,000 Pound Club (aggregate weight for his Top 3 Giants) and coveted Certified World Recognized Great Pumpkin Commonwealth (GPC) Jacket — Scott is the 1st grower in Western Canada to achieve this milestone — it’s kind of a BIG deal!!! And…Scott’s green monster squash weighed in at 725.5 pounds and set the new BC Squash Record!!! Scott was on Global BC’s Morning News (again) on Oct 28, 2015, with his heaviest 1st place giant pumpkin and squash!! This was contest #3 of 3!! Click 2015 for more. On Oct 3, 2015, Scott Carley’s giant pumpkin (1 of his 4 largest ones) weighed in at 1,411 pounds and placed 1st (out of 20 entries) at Krause Berry Farms in Langley, BC!! This is the second year in a row that Scott’s giant pumpkin placed 1st in BC!! Scott broke his own BC Giant Pumpkin record!!! This was contest #2 of 3!! Click 2015 for more. 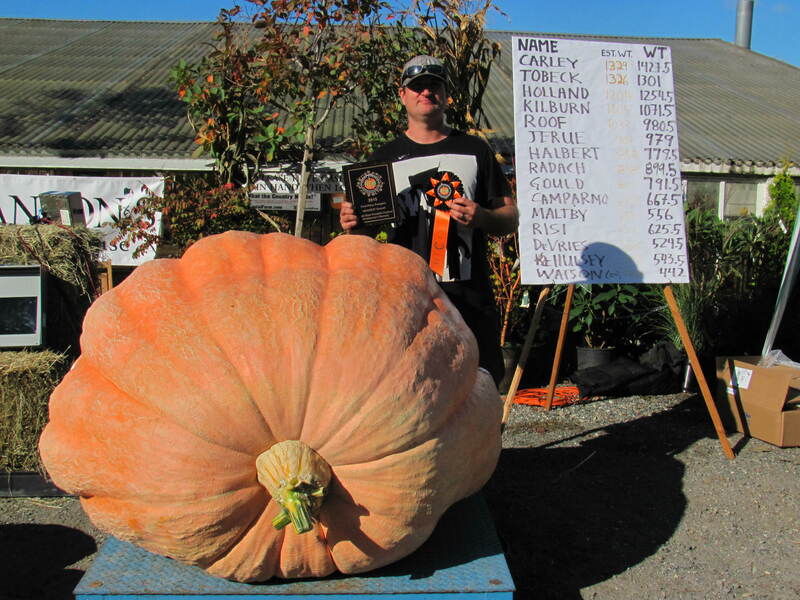 On Sep 26, 2015, Scott Carley’s giant pumpkin (1 of his 4 largest ones) weighed in at 1,427.5 pounds and placed 1st (out of 20 entries) in Skagit Valley, Washington, USA!! He was close to the site record of 1,450 pounds that was set by Giant Pumpkin World Record holder Joel Holland in 2014! This was contest #1 of 3 this season!! Click 2015 for more. Photo of Scott Carley with his 1st place award winning pumpkin on Sep 26, 2015. Click 2015 for more media. BC’s Great Pumpkin Commonwealth (GPC) representatives are Glenn Dixon and Scott Carley. Email us at giantpumpkinsbc@gmail.com — looking forward to hearing from you! I would love some of your seeds for growing huge pumpkins for next year!!! Love to get some seeds ! Hi! I’d love to try and grow a giant pumpkin for my husband- he’s a huge Halloween fan and pumpkin carver! Just saw on Global you’re giving some seeds away- if you’re not already tapped out we would love to try some! just saw you on the morning news! I’ve been growing big pumpkins in my backyard here in vernon secretly for the last 3 years. cracked 150 lbs with a seed from a dills Atlantic giant seed pack 2 years ago! would love to try your seed! can I email my address? will cover postage if needed! I just saw your clip on the morning news!! Congrats on your win. Hi, I Just Saw Your Husband On The Morning News And Said He Would Send Pumpkin Seeds To Anyone Who Wants Some….I Would Love Some! We Live In Williams Lake And Are Planning On Starting A Pumpkin Patch For Next Year AS The Closest One is About A 3 Hour Drive From Here! A Giant Pumpkin Would Blow The Kids In This Town Away! Thanks A Bunch! Your pumpkins are amazing! Congratulations! You mentioned something on the news about free seeds from your prize winning pumpkin, I would really like to be able to get a few from you. How do I go about this? I would love to be able to grow a big monster like that myself next year. Again congratulations and thanks for your time. Saw your segment on the Morning News! Great work! I would love to get some of your pumpkin seeds! Just watched the global TV segment showing your pumpkin – amazing. Wondering if you could send me seeds and any growing information. Would like to try growing a pumpkin next year. Would be great for the grandkids. Hello Jo-Anne, we received your self-addressed envelope with postage, thank you! The giant pumpkin seeds are presently drying and should be ready in a couple of weeks! Congrats on your win, amazing job!! Would love to try my luck with some seeds, growing season not great here in Mackenzie but by spring we are relocating to the beautiful Creston Valley, perfect growing conditions! Irene Bonthoux, PO Box 902, Mackenzie, BC V0J 2C0. Thanks so much! Would love to have a few seeds, I am happy to send a self addressed stamped envelope to eliminate your mailing costs. I don’t recall ever being so excited about a news segment! We love trying new seeds and watching the gardens flourish! I would be delighted and thankful to receive some seeds. I saw your segment on Global News and would like to order some of your Pumpkin seeds as a gift for my daughter and two little grand daughters who are avid gardeners. They grew an amazing garden this past season here in Prince George, and I know it would be fun for them to try to grow one of your Giant Pumpkins.I thought it would be a neat stocking stuffer for Christmas! Please let me know if you have any seeds left and I will send you our mailing address. Cheers!! If it is not too late….We would love a few seeds. We live on Texada Island,BC and they would surely be a hit at our farmers market in the fall. Thank you in advance. Sylvia Robillard, Box 49, Gillies Bay, BC V0N 1W0. Hello Sylvia, we received your self-addressed envelope with postage, thank you! The giant pumpkin seeds are presently drying and should be ready in a couple of weeks! Hello Vera! Two of our Giants are on display at Krause Berry Farms in Langley. They will be there until after Halloween. I hope you are able to see them! Our other award winning pumpkins are on display in Washington. Scott will be on Global BC’s Morning News on October 28th with the heaviest pumpkin and squash!